Halloween is around the corner which also marks the end of National Pizza Month. 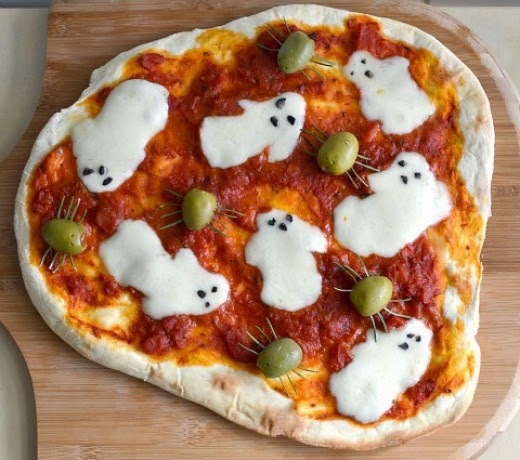 As a parent, I know that we have spent many a Halloween making sure some pizza gets stuffed into the children before the candy overload. So, why not combine the two ideas with some great social media marketing for your pizzeria? We've celebrated all month but now is the time for the grand finale for National Pizza Month. Here are some of the best ideas we have seen from readers just like you! 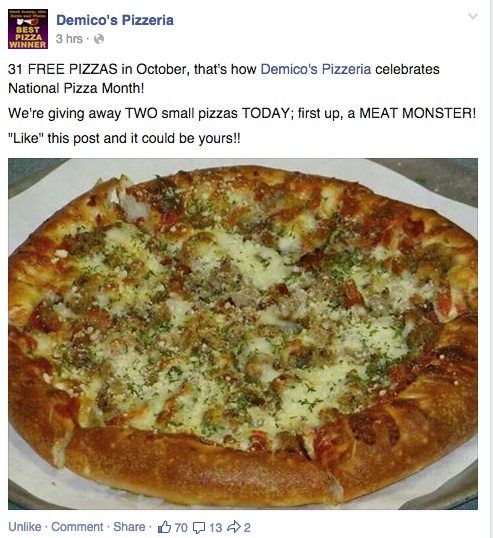 Demico's Pizzeria in North Canton, Ohio has been posting every day on Facebook giving away a pizza in honor of National Pizza Month. For a twist on Halloween to close out the month-long celebration, give away a family pack of pizzas or add a dessert pizza. Just do something even more special for Halloween! At YNot Pizza in Hampton Roads, VA, they've been using Twitter to do daily specials and making sure the #nationalpizzamonth hash tag is included. During the last week of National Pizza Month, there is a new coupon code for different pizzas. A way to boost that idea on Halloween is to provide the coupon code to work for all pizza types or the one that was most popular to get 50% off. #3 Emphasize your non-pizza menu. Sure it's #NationalPizzaMonth, but lets not forget about our wings. Wings pair well with football...and pizza... and EVERYTHING. Why not give away a sample of wings or provide a hefty discount if one or more pizzas is ordered? Maybe those who arrive in the store in costume on Halloween get a free appetizer? 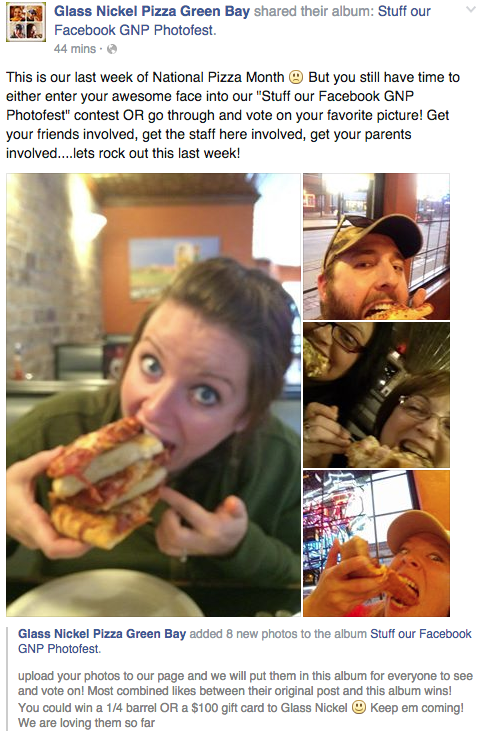 You can highlight a fun costume contest on our Facebook or Instagram page or do what Glass Nickel Pizza in Green Bay did and have a face stuffing contest for National Pizza Month. Maybe the winner gets free pizza but the other contestants also get a discount! You can also make it an in-store promotion where you do the social media photos of those who come into the store to order in costume! Then your fans can pick the winner to get free pizza. #5 Do a little bit of everything to close out the month of pizza! 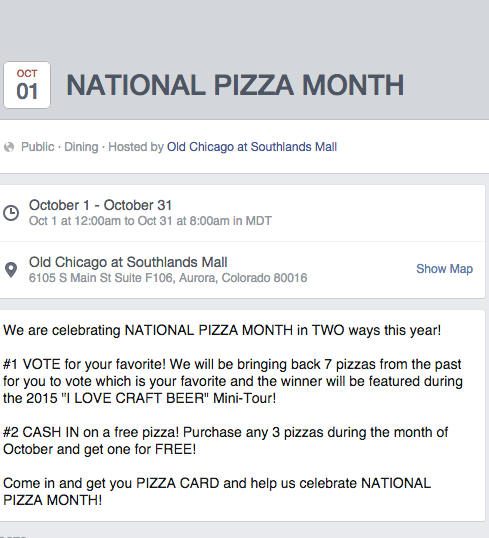 Old Chicago Pizza created a Facebook event to host their different ways they are celebrating. Why not send an invite out to your Facebook friends reminding them of the many ways you are celebrating all month or at least throw a Halloween event with your pizzeria specials!